The story of health care in our area is really quite fascinating highlighting so many aspects of the lives of our ancestors remote and recent. Back in the middle ages the care of the sick, infirm and injured became primarily the duty and responsibility of the church. Infirmaries and hospices were established in all towns, frequently on or near the premises of abbeys and convents. Those of my readers who are aficionados of Ellis Peters’ Cadfael will be very aware of his role as a medical herbalist for Shrewsbury Abbey. Beaulieu Abbey had its ‘inifrmarium’ with an adjoining chapel. I could not discover that the Augustinian Canons at Christchurch had a dedicated hospital but they were renowned for generous alms to the poor so it seems probable that some provision was made. But we are on much firmer ground in the eighteenth and nineteenth centuries when Poor Law records abound for our local parishes. Not only do they specify details regarding care of the poor but they tell us about hospital provision. County hospitals were established in the eighteenth century and the ill and injured from our local parishes were sent to them for treatment. Milton parish, for example, subscribed to and used both Salisbury and Winchester Hospitals. In August 1767 it was found necessary to send Francis Read to ‘Winchester Ospital’ (as it is recorded). The services of Dr. Bolton Simpson of Milford were sought to effect this because he was a subscriber though he was a Doctor of Divinity rather than of medicine and served as vicar of Milford from 1759-86. Milton paid one shilling ‘for going to Dr. Simpson to lern what Day they should carry Read to Hospital att Winton’, the parish then paid an additional two shillings to go to Lymington to get a post-chaise to transport the patient to Winchester. Thomas Villenowth was to carry Francis Read the 30 miles to the hospital at 9d. a mile. Read’s treatment was evidently successful for the parish recorded in December the expenditure of 8s. 10d. to bring him home. In March 1819 Milton parish paid its annual subscription of two guineas to Salisbury Hospital (Infirmary) which was built in 1767. The county hospitals, such as Salisbury, were funded by charitable contribution; usually made by the landowning gentry and aristocracy. Whilst these sizeable donations paid for the building and fitting out of the hospitals it did not provide revenue funding to cover their maintenance which was expensive and relied primarily on subscriptions and intermittent fund raising. Management committees, often known as courts, issued reports of their regular deliberations. Probably all our local parishes subscribed regularly, Ringwood supported both Salisbury Infirmary with a two guinea donation and additionally a four guinea subscription to the renowned Bath (St Michael’s) hospital. These institutions wrestled with problems that are still familiar to us today. For example the Court of Governors responsible for the management of Winchester Hospital, founded in 1736, reported in April 1800, “It appears to this Court, that the Expenses of this Charity greatly exceed the Income, from causes unavoidable, so likely to be of long continuance; that to remedy this misfortune two things are necessary, to reduce Expenses, and, if possible, to increase Income…to discourage expenditure ensure that Physicians and Surgeons be requested not to admit In-Patients, unless there is good ground to expect relief…to reject all those labouring under old incurable complaints…” Tough action for tough times! The local parish officers, overseers of the poor and churchwardens, had to take up the burden and appoint local doctors and surgeons to minister to those who could not afford to help themselves, a body which included both the unemployed and the fully employed labouring class. Midwifery was a regular and ongoing expense and though capable midwives and men-midwives were appointed to aid mothers in labour sadly the toll in lives at this time was relatively high and where difficult outcomes were foreseen the doctor was called in to provide professional advice and medicines. Lyndhurst overseers were faced with a pretty difficult choice when a servant girl, Rebecca Sedge, who for some time had suffered from severe problems with one leg, decided that the only solution available was to have her leg amputated. Brace yourselves—this was in 1815 long before anaesthetics were available— two surgeons were engaged to carry out the operation and a woman was employed to support Rebecca and, so far as possible, comfort her as the muscle was cut and her bones sawn through. 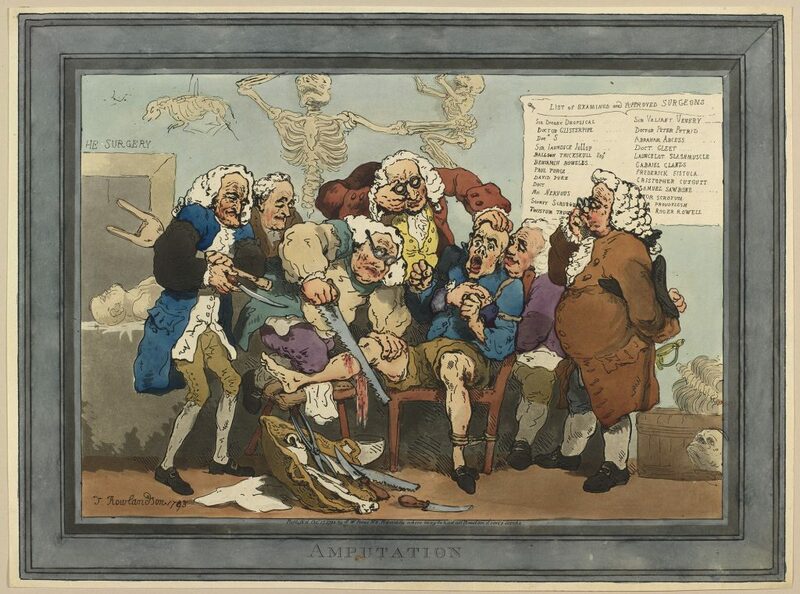 Thomas Rowlandson’s illustration of leg amputation in 1795 leaves nothing to the imagination. It is good to know that Rebecca came through this agonising ordeal. The overseers extraordinarily paid £2 to have her severed leg buried! For many years afterwards they were also at the expense of paying to have Rebecca Sedge’s shoe repaired. The collection of a ‘Poor Rate’ had been established by legislation in 1601 and the act contained certain key clauses that were to remain of crucial importance for a further two and a third centuries. It made each parish fully responsible for administration which was implemented by four elected officers in each year. Large parishes could elect up to four officers (this represented the birth of modern local government). These were to be known as overseers of the poor and churchwardens. It also enshrined the principle that every individual belonged to a parish, for ever afterwards known as the ‘parish of origin.’ Each individual parish was wholly responsible for the care and maintenance of the poor; a responsibility that was to be funded by levying a rate based on the assessed annual rental of land and property. The overseers collected the rate and disbursed it according to perceived need. For administrative purposes the year ran from Easter to Easter, and was divided into precise four-week ‘months’, which some years meant a long period, such as 1782-83 which contained thirteen 4-weekly ‘months’ plus one three-week month or a short year, such as 1786-87, which contained only twelve ‘months,’ plus one-three week month. You may well wonder why this scheme was adopted and I can only tell you that it reflected the ancient and well-established Christian (Julian) calendar. Generally, the accounts were administered by each overseer alternately: and these men, mostly farmers or traders, did the job voluntarily and most conscientiously. I wonder if there is a lesson to be learned there? Annually, at each Easter the accounts were audited by a Justice of the Peace (magistrate). The poor were categorised as either ‘impotent’ or ‘able-bodied;’ the first included the old, infirm, sick and insane, the second, those physically able to work but unemployed. How each group was aided depended very much on the ethos of the overseers and churchwardens. There is one thing I can tell you and that is a very strong thread of humanity and compassion which can often be detected through the stark administrative records, this is something I can assert this after over fifty years of detailed research into such records in many parishes throughout Hampshire and all the adjoining Wessex counties. But, at the same time, it is also evident that the overseers and churchwardens were very conscious that they were handling public funds, a responsibility that required circumspection in expenditure: nevertheless the overseers could be quite generous as in Hordle in 1806 when the surgeon ordered wine for Thomas Hodder’s family which came to £1 and, in the following year, John Edward received ‘half a pint of rum in his illness’ at the cost of 1s. 3d. 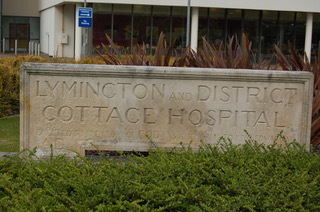 Lymington was somewhat slower in taking up the challenge of hospital provision. But in 1913 Lord Arthur Cecil of Passford House took up the challenge and initiated a fund raising committee to build and endow a cottage hospital. H. Bernton Benjamin, an architect living in the High Street, was engaged to draw up the plans. It consisted of two four-bedded wards and a single bed emergency ward, all heated with open coal fires. It was to be named the King Edward VII Memorial Hospital. 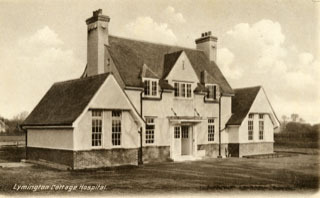 The hospital was destined to play and important role in the community and underwent a number of extensions to accommodate increasing demands and the development of services, such as the addition of early x-ray equipment supplied by one of Lymington’s unsung heroes, Arthur St George Caulfeild (1869-1933). The A&T, in its issue of 31 March 1933, published a short obituary notice of this gentleman which included the following: “Mr. St. George Caulfield (sic) installed the original x-ray apparatus in Lymington Cottage Hospital and interested himself in these experiments as a hobby, but subsequently the Cancer Hospital in London, valued his services so much that they built him a laboratory especially to undertake research work.” He lived latterly in Delawarr House at Woodside.